The eustachian tube, or auditory tube, connects the middle ear to the nasopharynx which is the upper part of the throat behind the nose. The tube is situated just above the floor of the middle ear and has triangular to oval shaped opening at both ends. Bone, cartilage, and fibrous tissue makes up the eustachian tube. Within the tube itself, there are also different surfaces, the upper portion of the tube is smooth, while the bottom portion of the tube contains cilia, or hair-like structures. Tube size in infants is approximately 17.5 mm, which then continues to grow to a length of about 37.5 mm when reaching adulthood. Angle of the tube in infants and children is only about 10 degrees from the eye-ear (Frankfort) horizontal plane. This differs in adults, where the angle is steeper at approximately 45 degrees. This difference of 30 degrees is considered to be one of the factors that increases the risk of children developing middle ear dysfunction, ear infections and fluid in their ears. Efficiency of muscle also differs in children and adults. There are 4 muscles that contribute to the opening and closing of the eustachian tube: tensor veli palatine, levator veli palatine, salpingopharyngeus, and tensor tympani. In chidlren, these muscles are more passive, while in adults, they have a more active involvment. This difference is also thought to contribute to increased risk for children developing middle ear dysfunction. On average the eustachian tube opens 1 to 2 times every hour. When opened, it normally only remains open for about 0.3 to 0.5 seconds. The eustachian tube however opens more frequently and for longer duration when yawning. Atmospheric pressure changes as you change altitude and as the weather changes. When the atmospheric pressure changes, the ear drum changes shape due to an unequalized pressure in the middle ear. 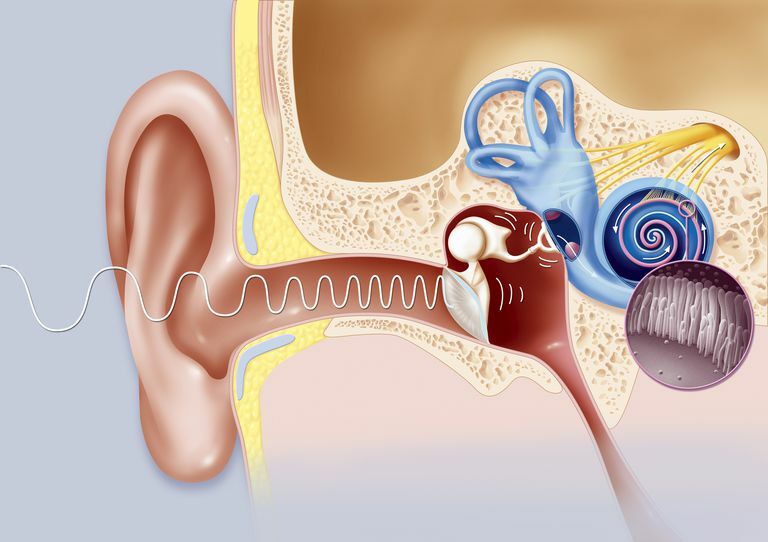 Without equalizing the pressure, the ear drum cannot respond to sound in the same way and your hearing is affected. If the pressure in the middle ear is not equalized and greater pressure is applied, you can experience pain and in extreme instances a ruptured ear drum can occur. When your ear does equalize you may experience a "popping" sensation. In order to maintain proper functioning of the middle ear, the space needs to be free of fluid and other debris. Tiny hair-like structures, known as cilia, actively move material toward the opening of the eustachian tube. This process is not gravity dependent and will occur normally unless there is a problem with the mechanism; like in the condition primary ciliary dyskinesia. Once in the middle ear, the bottom of the tube have mucus and cilia that beat (or move back and forth in a wave like motion); moving the material down the eustachian tube to the back of the throat. Several things can affect the normal function of this process by changing the viscosity, or thickness of the mucus in the eustachian tube. Examples of disorders that can change the thickness of the mucus includes: cystic fibrosis, otitis media, and sinusitis. Bacterial and viral infections can also affect the normal function of this process and may take up to 1 month after recovering for normal function of cilia to return. Other obstacles can also occlude or partially block the eustachian tube opening in the back of the throat. Enlarged adenoids and adenoids in small children can be a cause of this blockage. If necessary an adenoidectomy can be performed to free up space around the eustachian tube. This protection is interrupted by disorders that cause the eustachian tube opening in the back of the throat to remain open. Patulous eustachian tube is an example of this and is widely recognized by it's tell-tale sign of autophony, or unusually loud hearing of one's own voice or breathing. Siebert, J.W. & Danner, C.J. (2006). Eustachian Tube Function and the Middle Ear. Otolaryngologic Clinics of North America. 39(6), 1221–1235.